The Honolulu-Pacific Federal Executive Board endeavors to help federal employees understand their pay and benefits, including those specific to employees in the Honolulu-Pacific area of responsibility. This includes working closely with federal agencies on employee education, and communicating with the Executive Committee, Office of Personnel Management (OPM) staff and local congressional representatives on employee issues of specific local interest or impacts. The HPFEB does not lobby, or act in similar manner as employee unions, the focus in this area is to inform, collaborate and share information across the federal leadership. In general, the Office of Personnel Management (OPM) provides staff support for the Federal Salary Council and Presidents Pay Agent. OPM also provides leadership on pay systems for civilian Federal employees. 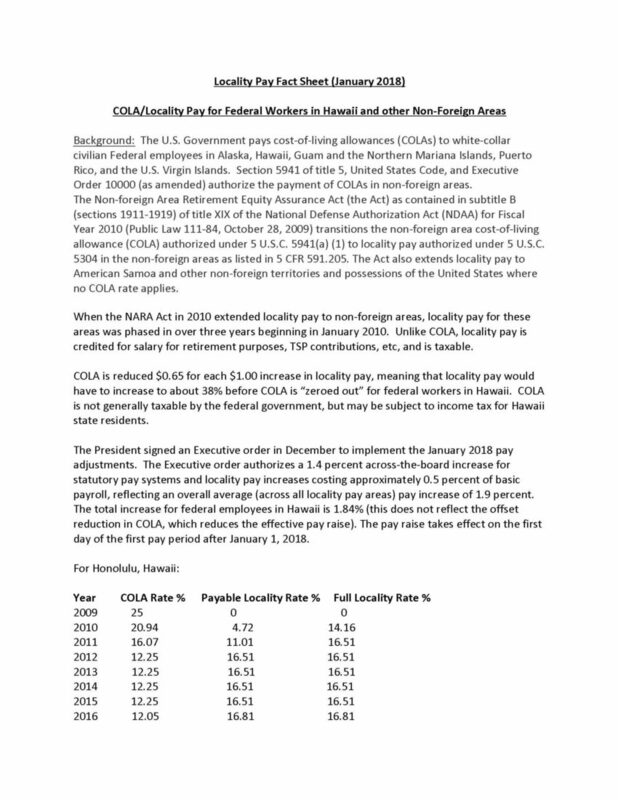 This is accomplished by developing and maintaining Government-wide regulations and policies on authorities such as General Schedule locality pay, the Federal Wage System, special rates, and pay for employees in Non-foreign areas (which includes Hawaii, Guam/CNMI, American Samoa and the Pacific remote islands). Ultimately, each Federal agency is responsible for complying with the law and regulations and following OPM’s policies and guidance to administer pay policies and programs for its own employees. Sub tabs include information on pay and leave administration, pay for SES members and LEO employees, and special rates. Also included are tables for pay for wage grade employees-which are managed under different pay schedules. See separate tabs for OPM policy on disability employment, diversity and inclusion, hiring information and human capital management. An overview on pay in the Non-foreign areas is included here (including discussion on the COLA/Locality Pay transition codified in the Nonforeign Area Retirement Equity Assurance Act of 2010). See the sub tabs on this page for the COLA and Locality Pay Rates in Nonforeign Areas. The primary portal for federal employees regarding pay and benefits can be found on the central OPM website. Healthcare (including Federal Benefits Open Season information), Dental and Vision Care, Life Insurance, Long Term Care and Flexible Spending Accounts. Each federal employee should endeavor to familiarize themselves with these critical benefits available to federal government employees. General Schedule (GS) Locality Pay Tables for 2019 can be found here.